The news today is that it appears GreenPois0n RC5 will be bringing untethered jailbreak to iOS 4.2.1 sooner rather than later. Twitter user @JHackstar tipped us off to a Wiki showing that GreenPois0n RC5 is ‘coming VERY soon’ and will support all devices. That’s great news on 3 levels. 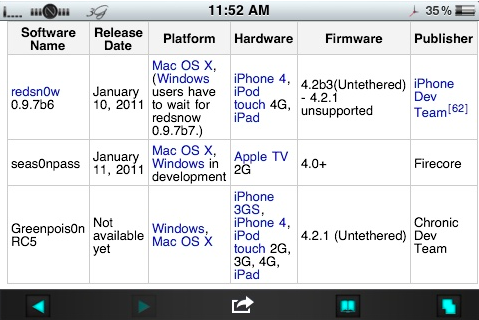 First, I’m sure plenty of you have been waiting for an untethered jailbreak on 4.2.1 for a long time now. Second, the new GreenPois0n will work on ALL hardware. It’s great to hear that nobody will be left out in the cold this time around. Thirdly, it’s good to hear a release isn’t too far away. More info coming as soon as we get it, so stay tunes folks!